It was an explosive episode of SmackDown after Wrestlemania 35, as we had a multitude of surprises on the show. The surprises ranged from the crowning of new SmackDown Tag Team champions to the appearance of RAW Superstars including Braun Strowman and Drew McIntyre on the episode. While the Superstar Shakeup takes place next week, it looked like WWE wanted to generate buzz for the event by having Superstars from the red brand show up. However, it looks like the exciting 6-man tag team match that main evented the show was not WWE's original plan. Kofi Kingston became the WWE Champion after 11 years of hard work and determination when he defeated Daniel Bryan at Wrestlemania 35 to become not only the new WWE Champion, but also a grand slam champion. Drew McIntyre, on the other hand, did not have great luck at the Showcase of the Immortals as he lost to The Big Dog Roman Reigns in his first singles match since his return to WWE. 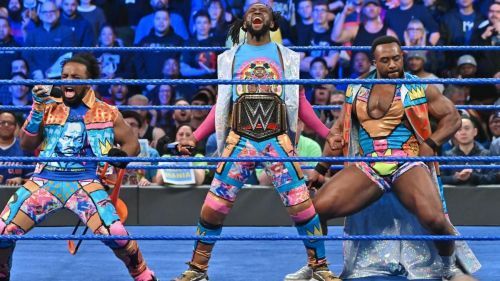 The Bar had interrupted The New Day's celebration of Kofi Kingston's WWE Championship win at Wrestlemania 35, and a 6-man match was set up between the New Day and The Bar, and Drew McIntyre. However, as per PWInsider (via Cagesideseats.com), WWE's original plans were to have a one one one match between Kingston and McIntyre. The plans were only changes later in the day due to unknown reasons. It is possible that WWE did not want to hurt Drew McIntyre by taking a loss at the hands of the Dreadlocked Dynamo. Even though The Scottish Psychopath's appearance on SmackDown could be a hint that he may be moved to SmackDown in the upcoming Superstar Shakeup, there have been reports that WWE is planning a feud between McIntyre and Seth Rollins. WWE Rumors: WWE planning an interesting shakeup for SmackDown after Wrestlemania 35?